Darlings, need I remind you that, while each and every one of us favors a particular time of year (for me, it’s fall! ), we must welcome all four seasons with open arms, and accept the special gift proffered from them all. As Yoko Ono once said, “Spring passes and one remembers one's innocence. Summer passes and one remembers one's exuberance. Autumn passes and one remembers one's reverence. Winter passes and one remembers one's perseverance.” These are words to live by, my loves, as they are an uncomplicated way of shedding light upon the beauty of life – year-round! I know, I know; you may find it simpler to cook the hearty meals required to get you through a long winter, or perhaps dressing for the sultry summer is more appealing than layering for the cool chill of fall. Regardless of your preference, surviving twenty-four hours a day, seven days a week, three-hundred and sixty-five days a year is possible – at least according to Mireille Guiliano. Brace yourselves, kitty cats…something wondrous this way comes. 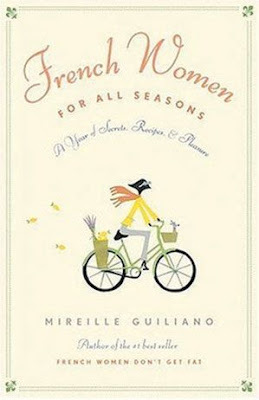 In true seasonable style, Café Fashionista has teamed up with Vintage Books to bring not one, not two, but three (3) of you lovable lambs Mireille Guiliano’s French Women for All Seasons; a follow-up to her bestseller French Women Don’t Get Fat, full to the brim with yummy recipes, and even yummier tips on entertaining, grooming, shopping, exercising, cooking, and everything in between to ensure that you live your life to the fullest from beginning to end! ♥For one (1) entry, leave a comment on this post between now and Thursday, March 25, 2010 at midnight PST. ♥For two (2) entries, Twitter about this giveaway, and leave a comment on this post between now and Thursday, March 25, 2010 at midnight PST with your Twitter URL. ♥For three (3) entries, become a follower of Café Fashionista on Blogger/Google Reader/Google Friend Connect/Twitter, and leave a comment on this post between now and Thursday, March 25, 2010 at midnight PST (if you are already a Café Fashionista follower, please say so in your comment). I will randomly pick three (3) names out of a hat (who knows, one of them could be yours! ), and announce the winners on Friday, March 26, 2010. Thanks to The Hippo for the picture. I agree I love fall, Spring is a close second! I loved the first book, would love to have the 2nd book. Love your blog. This is an awesome giveaway! I already follow your blog! I so need to find out the answers. This looks like a book that will give me the answers. This looks wonderful! :-) Fall is my favorite season too. i hope i win! happy friday! xoxo. ps. im a new follower :-)! Ah! I'm so curious to read mirelle guiliano's books! Awesome giveaway! I'm such a francophile it's ridiculous. Let's all go to Paris, soon! Ooo thanks for the wonderful giveaway. I'm sure whoever gets it will be thrilled. Fabulous give-away (we all want to know the little secrets of French women, don't we?). Summer will always be my favourite season! How great! I'm a follower of your lovely blog. and I will tweet this asap. This is so exciting, I will be that much closer to having the perfect personal library. Already a follower and really would love this, i adored the first book...I could review it on my blog too!! Ahhh!!! Another give-a-way! Thanks so much :D I'm a follower. i loved her first book - french women dont get fat! so many wonderful, simple recipies! Ooh I'd love to win this and read it! I'm a follower! Autumn is definitely my time of year ... not least because that's when my birthday comes. I am however loving the current spring freshness that we have. I already follow on Google Reader, and just tweeted (oohlalacherie). What great spring spirit! I love it! I read that book! It's absolutely fabulous!! Loved the first book (which I read thanks to you!). I hope I win, that dress is divine! You're great Erika! Great giveaway! I'm also a follower via blogger. Fabulous Friday giveaway! I would love some great reading material for Spring Break. Have a great weekend Erika! Great giveaway! I've read one of the authors previous book, and it was definately well written and interesting. Count me in,I'm a follower!The book sounds great! My favorite season is fall too! Love the crisp breeze and foliage. What an awesome giveaway. Lovely blog! I have two of her books, including this one and I adore them! She has a point and encourages women to enjoy the life to it's fullest without feeling guilty about bad eating habits! Lovely weekend to you dear! Erika, fab giveaway! I have never read any of her books, but these sound wonderful. And I follow you on Twitter! Just followed you on Twitter! Follow me, girl! Nice giveaway! I am glad it is open to international readers!! Do I have to leave three comments if I do the three thing? I will do just in case. Thank you so much darling for your comment! Hoping we'll be lucky at this "Art and Crafts market" selling many creations! I really liked Mireille Guiliano's first book. I bet the second one is just as lovely. I am a summer person. But I think it comes with all the stuff that goes on around here for it. I also follow you on twitter and google reader!!! I heard this book is fabulous. Love when you do book giveaways. What a fabulous giveaway - count me in! Oh yes please, Erika! These books look fab! and i'm a follower on google reader. I'm a google follower! crossing my fingers. i'd like to read the followup. :] french women dont get fat, it was a good book. :] nice to be back here. great writing as always. This is SUCH a fabulous giveaway! You always have the best ones. :) This book looks amazing and perfect for spring. And I am already a follower!! Yay! I tweeted. I am Jenniferb02. Autumn is the best season; yellowish leaves decorating the streets, the beggining of the "hot chocolate" phase, the change between summer and winter, the urge of getting closer and closer to christmas... priceless! i am very fond of your blog. very peaceful and pretty background. I read French women don't get fat and wholeheartily agree! i just found your blog. and i really like it. looks like a great competition! What a great read, and great giveaway! hey lovely lady! i found your blog via mara's, and your comment on the gaslamp quarter (san diego is by far my favorite city EVER!) so i knew i had to check out your blog. those books look great! i love reading memoirs. have a great weekend! Count me in! This looks like utter perfection! I've twittered and I'm a follower! I loved the first book! have a great weekend! What a lovely giveaway! I am a google reader follower. here I am! the 102 on 101 participants. I love the summer. It's like Ada Louise Huxtable said: Summer is the time when one sheds one's tensions with one's clothes, and the right kind of day is jeweled balm for the battered spirit. A few of those days and you can become drunk with the belief that all's right with the world. I haven't read either, they sound so interesting!! Cafe Fashionista is very cool :o) And I love contests! I will spread the word on Twitter. I've been twittering the good news about CafeFashionista's contest!! Oooh I would love to win this :) Thank you for being an international giveaway! I'm a follower on google friend (the thing in your sidebar) and have tweeted about it on twitter.com/geisharocks - hope thats all i need for the 3 entries! I honeymooned in Paris... love the women there. I think this book is just what I need to tap into my inner Parisian woman. tweeted, following, and posting comment #2 (hope I win). i gotta say, spring is my favorite season! i am a follower on twitter and on google connect too! ♥For one (1) entry: I love your giveaways! Already a Café Fashionista follower! Wow, I just watched Julie & Julia and the recipes in that book would be perfect! LOVE your site, and especially the way you think! Love this giveaway and this book is so adorable . And I was your follower already . so 3 entries and count me in ! Really hope I can win this giveaway . Lovely giveaway, and very appropriate for the finally-changing season!